Welcome to another episode of acts of negotiation. For today I want you to see yourself as a skilled negotiator but before we fly let’s take a ride. I posted on the facebook page that, To be successful at anything you must have what’s called a “postive self concept.” A “positive self concept” is attained only when you believe you can do or accomplish anything. The fact is that sometimes you have to trick yourself into believing it first. Whether it involves becoming an engineer, soccer star, rockstar,doctor or even to sleep. You must see and identify yourself as that person. An old man whom I don’t know if he is wise puts it this way, “fake it till you get it.” Lets put it another way, you have to eat, drink and sleep with it. To become a successful negotiator, you must negotiate 24/7. Practice they say make perfect. You can’t say you are a terrific negotiator only at work. Yet you can’t beat your brother in a friendly negotiation over a plate of salad or even who gets the turn to play with the dog. I hope you now know where am going with all this. 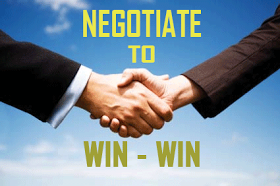 To be a skilled at negotiator at work, you must also be one when you are off the office. Go pro pal. Look! Even though I run a start up business, I see my self as a strategic negotiator. Always on the move creating lots of win win situations. To close, are you a skilled negotiator? What’s your answer? If your answer is an unequivocal yes, congratulations because you have just won for yourself 20 million. Hey! Don’t get it twisted you have attained 20% of the negotiation skill as far as you are in the negotiation mind frame and next we will be moving in our next episode and till then, keep your fingers crossed. Time for action Begin to see yourself as a strategic negotiator from today and see the vast opportunity that awaits you to win and save. Cheers! !